Grandparents are always on the lookout for healthy recipes their grandkids will actually eat. By using some simple substitutions (like whole grain bread) this dessert is actually pretty good for you. Partner it with a cold glass of low-fat milk and enjoy right along with those adorable grandkids! 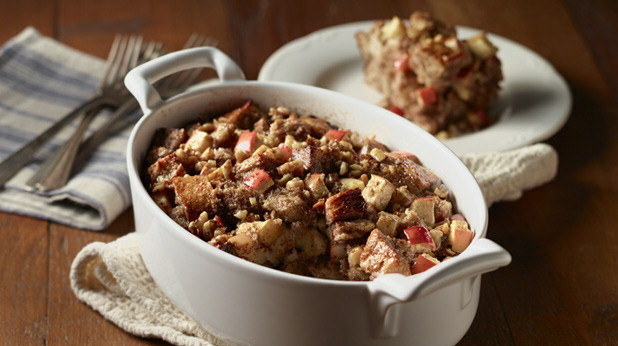 Whole grain bread, apples and cinnamon make a sweet dessert that is healthy too. Serve warm and enjoy with a glass of skim or low-fat milk! Spray 9×9 baking dish with cooking spray. In large bowl, whisk together egg, egg white, milk, sugar blend, vanilla, cinnamon, and cloves. Add bread and apple cubes. Add fruit or nuts if desired. Mix well.